Sip to the soldiers at Cabo Wabo Cantina! Sammy Hagar’s rockin’ cantina will honor military members by hosting a four-day celebration from Friday, May 22 through Monday, May 25. Cabo Wabo will celebrate with signature cocktails, drink specials, mouthwatering menu items and entertainment. Performing live on the Strip-side patio, Rein Garcia will take the stage on Friday, May 22 and Sunday, May 24; and Shawn Eiferman will perform on Saturday, May 23. Guests can enjoy Dos Equis and Heineken beer buckets, priced at $21; as well as signature cocktails including Sammy’s Toasted Colada, crafted with Sammy’s Beach Bar rum, Coco Lopez and fresh pineapple juice, priced at $14; and the CW Mai Tai, blended with Sammy’s Beach Bar rum, Captain Morgan, Orgeat, orange Curacao, tropical juices, grenadine and topped with a float of Myer’s rum, priced at $14. Menu selections include the chicken al carbon burrito, prepared traditionally or enchilada-style and topped with creamy tomatillo sauce, priced at $15.95; and the short rib enchiladas, made with shredded beef, fire-roasted tomato sauce and topped with a delicious house cheese blend, priced at $16.95. Cabo Wabo Cantina inside Miracle Mile Shops at Planet Hollywood will host action-packed viewing parties for upcoming Ultimate Fighting Championship (UFC) fights. The Strip-side party destination will serve as an ultimate fighting headquarters for UFC 187 on Saturday, May 23 and UFC 188 on Saturday, June 13. The championship bouts will be shown in Cabo Wabo’s exclusive upstairs lounge, The LOFT, on numerous flat-panel big-screen TVs, including a 184-inch video grid, a 180-inch projection screen and two 80-inch high-definition TVs. For an admission fee of $30 per person for UFC 187 and $25 per person for UFC 188, guests will take in the Pay-Per-View fights while enjoying panoramic views of the Strip, beer bucket specials, signature cocktails and a full list of menu items available for purchase. Time: Doors open at 6 p.m. Mom knows best! Cabo Wabo Cantina will go the extra mile this Mother’s Day by offering a complimentary breakfast and “mom-mosa” to all mothers from 8 to 11 a.m. on Sunday, May 10. Mothers may choose from a variety of Cabo Wabo’s signature breakfast selections including the CW eggs Benedict, made with layers of machaca, chorizo and poached eggs on an English muffin, topped with melted pepper-jack cheese and hollandaise, priced at $13.95; the breakfast quesadilla, a delicious combination of scrambled eggs, bacon, avocado, pico de gallo and cheddar and jack cheese served in a flour tortilla, priced at $11.95; the croissant French toast, a freshly-baked croissant classically prepared into French toast, topped with warm maple syrup, fresh berries, powdered sugar and whipped cream, priced at $10.95; and one complimentary signature or blood-orange “mom-mosa.”To receive the special offer, moms must be accompanied by another adult, age 18 or older. Pick a horse and stay the course at Cabo Wabo Cantina! Sammy Hagar’s hard-rockin’ cantina will host a Kentucky Derby viewing party beginning at 10 a.m. on Saturday, May 2. In honor of “the most exciting two minutes in sports,” Cabo Wabo will offer drink specials including Mint Juleps crafted with bourbon whiskey and fresh mint, priced at $8; beer buckets of Dos Equis beers priced at $21; and shot specials. The cantina’s signature menu items and cocktails will also be available for purchase. Cabo Wabo Cantina will celebrate National Military Appreciation Month by offering a 20 percent discount to all active duty military members and veterans with valid military identification during the month of May. Veterans and active duty service members can choose from dishes including the shrimp tacos made with crispy breaded shrimp, cabbage, chipotle crema, pico de gallo and lime, wrapped in a warm flour tortilla and served with rice and refried beans, priced at $16.95; the Wabolicious cheeseburger, served with pepper jack cheese, guacamole and pico de gallo, priced at $16.95; and the lobster enchiladas, a combination of rock lobster, a house cheese blend and chipotle-brandy cream sauce, priced at $21.95. Signature cocktail selections will include Sammy’s Toasted Colada, crafted with Sammy’s beach bar rum, Coco Lopez, pineapple juice and garnished with freshly toasted coconut, priced at $14; the Mango Picante margarita, made with jalapeños, mangos, Cabo Wabo blanco tequila, triple sec and sweet and sour, priced at $14; and the Key Lime martini, a combination of Sammy’s beach bar rum, Ke Ke liqueur, lime juice, and banana, served with a graham cracker crust, priced at $12. Forget the siesta and hit the fiesta! 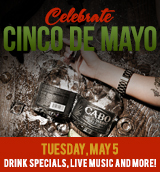 Cabo Wabo Cantina will host a fired-up Cinco de Mayo fiesta on Tuesday, May 5. Sammy Hagar’s rockin’ cantina will celebrate Cinco de Mayo on the Strip-side patio with drink specials, live music and more. Drink specials will include the Cabo flight, three sample shots of different Cabo Wabo tequilas, including blanco, reposado and anejo, priced at $21; a variety of ice-cold cervezas and signature margaritas including the mango picante margarita, a refreshing blend of jalapeño, mango, Cabo Wabo blanco tequila, triple sec and sweet and sour, priced at $14. Cabo Wabo will also serve their signature Cabo San Lucas-inspired dishes including the nacho platter, crafted with a house cheese blend, refried beans, jalapeño, Cotija cheese, pico de gallo, sour cream and guacamole, priced at $14.95; and the cilantro jalapeño chicken, grilled chicken breast prepared with jalapeño, onion, cilantro, pepper-jack cheese and jalapeño ranch, served over Mexican squash, roasted corn, tomato and poblano pepper, priced at $17.95. Cheers to beer! Cabo Wabo Cantina will commemorate National Beer Day with rockin’ specials on Tuesday, April 7. The cerveza-fueled fiesta will include buy-one-get-one drafts of the Red Rocker’s signature Red Head beer, priced at $8; as well as an extensive selection of draft, domestic and imported beers. Guests may also choose from Cabo Wabo’s signature menu items including the carne asada tacos, made with grilled steak, salsa arbol, avocado, cilantro and onions, priced at $15.95; and the short rib enchiladas, crafted with shredded beef, fire-roasted tomato sauce and a delicious cheese blend, priced at $16.95. Cabo Wabo will also offer a Maine lobster burrito, made with fresh Maine lobster wrapped in a warm tortilla and complemented by onion, tomato, garlic and white wine cream, priced at $23.95. LAS VEGAS – Cabo Wabo will host action-packed viewing parties for upcoming Ultimate Fighting Championship (UFC) fights. The Strip-side party destination will serve as an ultimate fighting headquarters for UFC 185 on Saturday, March 14 and UFC 186 on Saturday, April 25. The championship bouts will be shown in Cabo Wabo’s exclusive upstairs lounge, The LOFT, on numerous of flat-panel big-screen TVs, including a 184-inch video grid, a 180-inch projection screen and two 80-inch high-definition TVs. For an admission fee of $30 per person, guests will take in the pay-per-view fights while enjoying panoramic views of the Strip, beer bucket specials, signature cocktails and a full list of menu items available for purchase. Drop the books and take some shots! Cabo Wabo Cantina will be party headquarters for the 2015 spring break season with drink specials, music and more, every day from Sunday, March 1 through Friday, April 10. Sammy Hagar’s rockin’ cantina will transform into the ultimate spring break destination with live music, as well as beer pong and flip cup tournaments. Dos Equis beer tubs will be available on the Strip-side patio. Live music acts will include acoustic sensations from the The Ryan Whyte Maloney Trio, Shawn Eiferman and Rein Garcia. A popular local DJ will also keep the party going with various electronic music selections. Guests can enjoy Dos Equis beer buckets, priced at $21; as well as Cabo Wabo’s signature cocktails including the Cabo Rockin’ Iced Tea, crafted with sweet tea vodka, lemonade, fresh mint leaves and served on the rocks, priced at $14. Slam dunk! Cabo Wabo Cantina will transform into the ultimate sports hub for NCAA fans during March Mayhem from Tuesday, March 17 through Monday, April 6. The LOFT, a luxurious new event space directly above Cabo Wabo Cantina, will feature games on multiple flat-panel, big-screen TVs including a 184-inch video grid, a 180-inch projection screen and multiple 80-inch HD TVs. The games will also be shown on more than 20 high-definition TVs located throughout the lower-level cantina area, where regular menu items will be available for purchase. Game time bites include the nacho platter, served with a house cheese blend, refried beans, jalapeños, cotija cheese, pico de gallo, sour cream and guacamole, priced at $14.95. Drink specials include beer buckets priced at $21, shots delivered by beautiful “shot girls,” or select beers from the beer tubs on Cabo Wabo’s Strip-side patio. “Kiss me, I’m Irish!” Cabo Wabo Cantina will host a patio party with a bevy of lucky specials on Tuesday, March 17. In addition to Sammy Hagar’s signature margarita with an Irish green twist, crafted with Cabo Wabo tequila and Grand Marnier and served on the rocks, priced at $10; Cabo Wabo Cantina will also offer green beer, shot specials and beer tubs filled with select import and domestic brews. Signature dishes will also be available including the queso fundido con chorizo; made with house chorizo and a mouthwatering Mexican cheese blend, melted and served with warm tortillas and salsa, priced at $10.95; and the cotija cheese crusted quesadilla, made with carne asada or chicken, pico de gallo, sour cream and guacamole, priced at $8.95. Cabo Wabo Cantina will satisfy NASCAR fans’ need for speed with viewing parties, drink specials and giveaways from Friday, March 6 through Sunday, March 8. Racing fans can watch the fastest drivers in the world zip around the Las Vegas Motor Speedway in The LOFT, a lavish new events space above Cabo Wabo Cantina, on a number of flat-panel, big-screen televisions including a 184-inch video grid, a 180-inch projection screen and multiple 80-inch high-definition televisions. Motorsports enthusiasts can toast to their favorite drivers with the Can’t Drive 55, a blend of Cabo Wabo blanco tequila, Sammy’s beach bar rum, vodka, gin and splashes of lime, orange, pineapple and cranberry juices, finished with a touch of amaretto Disaronno, priced at $15. To commemorate the fast-paced weekend, NASCAR fans will receive a complimentary Cabo Wabo souvenir glass with each purchase of the signature cocktail. Guests may also keep the party going with beer bucket and shot specials, as well as signature margaritas and Cabo Wabo’s mouthwatering menu items.